One Pretty Little Box: Motivation for your Monday: Reboot your motivation! Motivation for your Monday: Reboot your motivation! This afternoon I got home and started right on my home blessings ~ even though I know that I am coming down with something. Most likely just allergies but it doesn't make it feel any better! I had put a few tasks I wanted to accomplish in my afternoon into my Erin Condren Life Planner while I had a few moments of quiet at work and knew that if I just got those done I would be happy! Did you know a blog post was NOT on that list ~ but was being written as I worked. In fact, as I worked, I just did what needed to be done, and little did I know I had placed a few of those onto tomorrow's list of to do's ~ but thankfully out of diligent work and a heart that desired to take care of our home and make it a comfortable place for my family to be, I got it all done. Everything from removing, washing, and replacing sheets on the master bedroom, both bathrooms being cleaned, a dishwasher ran and emptied, floors cleaned, and the cat box taken care of. I can say that I am a bit bothered by the one thought I had while working. We all have seen/ heard the saying that a dirty house is a sign of happy house because the mom is allowing her children to have fun. Can I say how much that irritates me!? A good mom has a deep relationship with each of her children that is as unique as the child. A good mom has the ability to find and be an example of balance. A good mom can read her children like a book and if you are living in chaos, you will not be able to know a sour mood that is caused from exhaustion vs social difficulties at school. 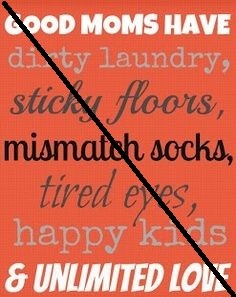 A good mom takes care of that which God has blessed her with which yes, includes cleaning your home on a regular basis. A good mom cries, laughs, says she is sorry, and above all.... loves without condition.